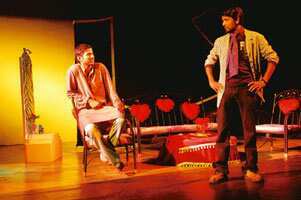 On stage: Vakra, the Kannada version of the French play Le Misanthrope. In spite of her sniffle, Isabel’s chiffle. Some girls with a sniffle would be weepy and tiffle; they would look awful, like a rained-on waffle. But Isabel’s chiffle, in spite of her sniffle..." trails Arundhati Nag, reading out lines by the American poet Ogden Nash. Nag is the creative director of the Bangalore-based theatre space Ranga Shankara, which has laughter as the theme of its annual festival this time. The 10-day festival, which begins on 5 November, will showcase six plays, apart from a Hasya Kavi Sammelan in Hindi/Urdu on 10 November and one in Kannada on 11 November. The festival will also feature a “nonsense poetry" reading session that will include crazy verses by Harindranath Chattopadhayay and T.P. Kailasam, among others. Nag says picking plays that promised a laugh was a tough act because the definition of humour varies across cultures. “This is why Indian cinema and theatre have used body humour to make audiences laugh. A person with a stammer or a slip on a banana peel," she says, adding, “But in this festival we want to explore political satire, black comedy, farcical humour, parody and more." The young playwrights, directors and poets whose works are a part of the festival use humour in different ways: Project S.T.R.I.P. (13 November), written by Ram Ganesh Kamatham, deals with a serious topic, interlacing it with satirical twists. Director Quasar Thakore Padamsee says the comedy in the play was incidental. “We didn’t go out and actively look for humour. Both Ram and I agreed on the topic and started to create a project that would talk about corporate development. Ram weaved in the humour and then more was added during the rehearsal," says the 31-year-old director. The festival will open with a Marathi play titled Olakh na Palakh, directed by Mangesh Kadam, and will be followed by a play in Tulu (spoken in parts of Karnataka) the next day. The delicate humour makes Chekov ki Duniya, scripted and directed by Ranjit Kapoor, a must-watch at the festival. Director and musician Swanand Kirkire, who wrote such hits as Bawra Man Dekhene Chala and other songs in the film Hazaaron Khwaishein Aisi, believes that timing is the most important aspect of comedy. “A serious play can run on intense emotions, but for humour, actors do the trick. It’s like a song, miss a beat and you drown," says Kirkire, whose play Aao Sathi Sapne Dekhen is a light-hearted Hindi musical with a contemporary script and songs set to folk music. Kirkire, who also won a national award for his work as a lyricist for the movie Lage Raho Munna Bhai, will sing in the play himself.